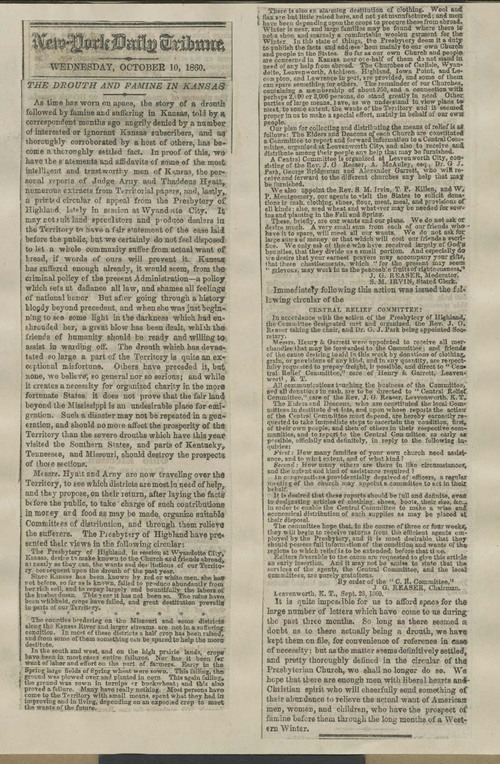 This newspaper article, published in the New York Daily Tribune from October 10, 1860, outlined the basic details of the suffering and destitution of settlers in Kansas. It also included reprints of two circulars originating from Kansas Territory. One was from the Presbytery of Highland, and the other was from the Central Relief Committee based in Leavenworth. The first reprinted circular provided information about the dire situation and gave the names of the members of this committee. The second circular requested that the elders and deacons of each church in Kansas ascertain how many families needed immediate assistance in order to present a full report to the Central Relief Committee. New York Daily Tribune, "The Drouth and Famine in Kansas"
This source can inform students about how Kansans coped with the drought and their resourcefulness during difficult times. It could be grouped with any of the sources related to the drought and famine of 1860, including Thaddeus Hyatt's letter to President Buchanan, Orinda Baker's reminiscence, "The Appeal to the Kansas Sufferers!" and the article in the Junction City Union.